Cut out one side piece and one front piece and the bottom piece from a paper lunch bag. 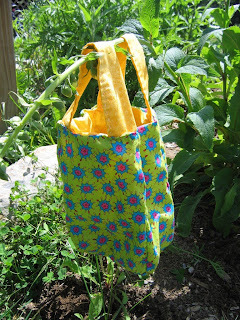 You are going to make two bags of fabric - one for the outside and one for the liner. For each bag, pin and cut out two front/back pieces, two side pieces, and one bottom piece, using the paper bag template pieces you cut out. Sew the side pieces together, right sides together, leaving a 1/4 inch seam, continue around bag. Sew the bottom piece on after pinning right sides together. Now: Turn the outside piece (bag) right side out and the lining piece (bag) inside out. Fit the outside piece inside the lining, and line up the top edges. Pin and sew around the edge, leaving a 2 inch opening. Through the opening, turn piece right side out, sew opening closed. I cut a rectangle out of paper for a template for the handles. Turned in a 1/4 " seam allowance on each long side, pinned together (lengthwise) (right sides are out), and sewed along edge and then sewed the handles on. You can also add some velcro to the inside top edges to close securely.